When tropical storm Gita passed over New Zealand on 20-21 February this year, high winds and low pressures combined with energetic ocean swells caused significant storm surges along the New Zealand West Coast. Storm surge is the abnormal rise of water generated by a storm, over and above the predicted astronomical tides. When accompanied by high waves, this surge can cause significant damage to coastal areas, including flooding and accelerated erosion. The forecast model predictions of storm surge and wave height during the storm are shown in Figures 1 and 2, respectively. Modelled wind and rainfall are also presented in these figures. 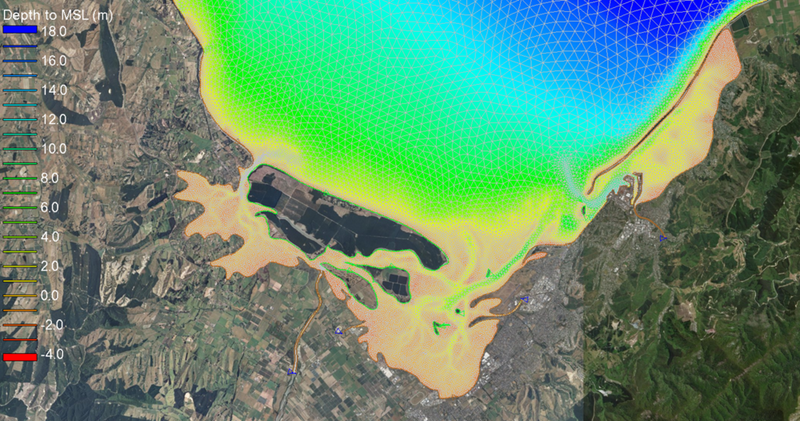 These operational models are produced by MetOcean Solutions for a range of applications in NZ waters. The models are tuned to replicate the typical conditions, so verifying the predictions under an extreme storm is a powerful test. Figure 1: Predicted storm surge progress: wind and rain (left) and storm surge (right) coincide as tropical storm Gita passes over New Zealand. Figure 2: Predicted wave progress: wind and rain (left) and wave height (right) forecast as tropical storm Gita passes over New Zealand. In Figures 3 and 4 we present the time series comparison of measured and forecast storm surge and wave heights. Figure 3: Time series of the storm surge as measured by the Charleston tide gauge data (Source: LINZ) and the MetOcean Solutions forecast values. The tide gauge reads higher values due to wave setup and the close proximity to shore. Figure 4: Time series of the measured and modelled significant wave height at the offshore wave buoy (Source: OMV). Through our web portal MetOceanView, MetOcean Solutions provide automated storm watch services for coastal and offshore operators. These are automatically generated when preset conditions are identified within the forecast horizon. During the lead up to Gita’s landfall, significant wave heights of 8-9 m were predicted more than 3 days ahead (Figure 5). Warnings are sent via email alerts for operational decision-making - increasing safety and efficiency for people working at sea. These warnings are based on an ‘ensemble’ of forecasts of the winds and waves, which captures the inherent uncertainty over a 7-day forecast horizon and the chaotic nature of a revolving tropical storm. Probabilistic guidance allows effective management decisions to be made within a robust, quantitative framework. Figure 5: Gita was forecast to be wild! 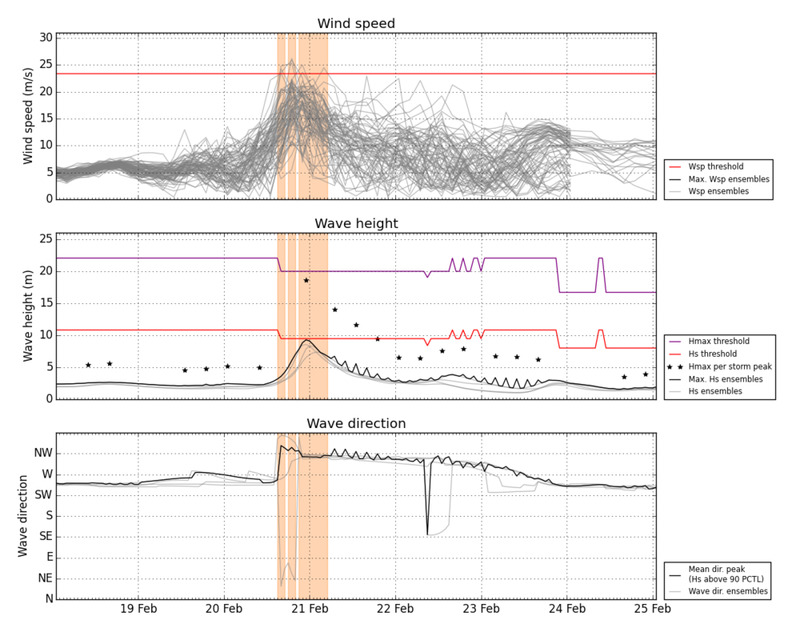 Example of the ensemble forecast warning system that provided guidance on the range of possible outcomes for wind speed (top), significant wave height (middle) and wave direction (bottom) in the offshore Taranaki area. For more information on our forecast models, contact us at enquiries@metocean.co.nz. Forecasts of wind and wave conditions are vital for effective and safe management of near- and offshore operations. MetOcean Solutions has developed a warning system based on ensemble forecasting, which allows us to provide warning of upcoming severe wind and wave conditions for up to 7-day horizons, thereby helping operators plan for safe and efficient management. 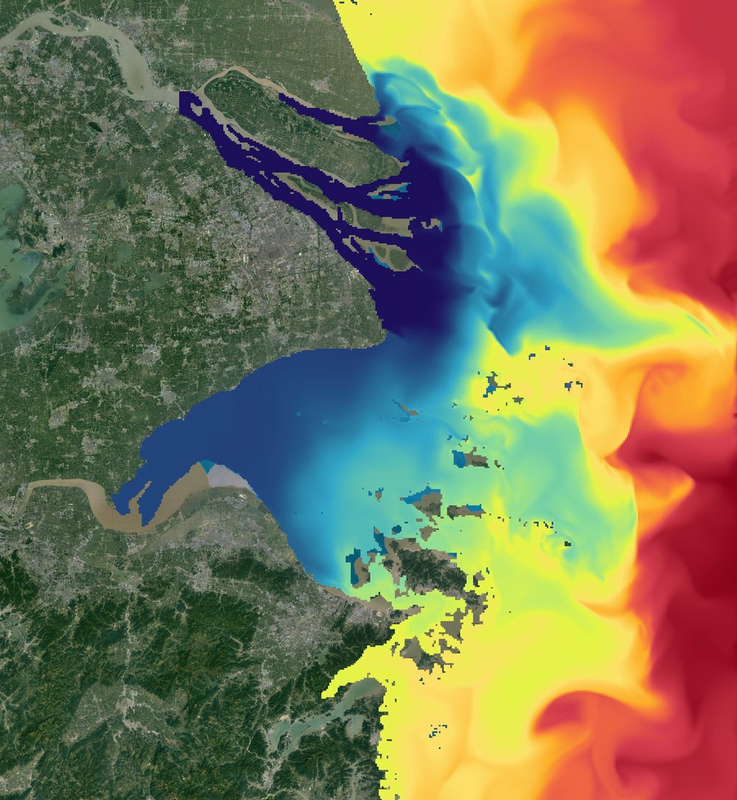 Accurate high-resolution forecasts of wave conditions at local scales can be done using nested or grid-refining models such as SWAN (Simulating WAves Nearshore). Such forecasts capture local wave transformation and dissipation, and can be done at a reasonable computational cost. However, at horizons beyond 2-3 days a forecast inevitably suffers from the onset of chaotic uncertainty that is a physical characteristic of the atmosphere-ocean system. Ensemble forecasting is a method that quantifies this uncertainty in longer-range forecasts, providing probabilistic guidance for management decisions. MetOcean Solutions can customise a forecast warning system for any offshore or nearshore location based on the 7-day forecast wind speed, significant wave height (Hs) and maximum individual wave height (Hmax). 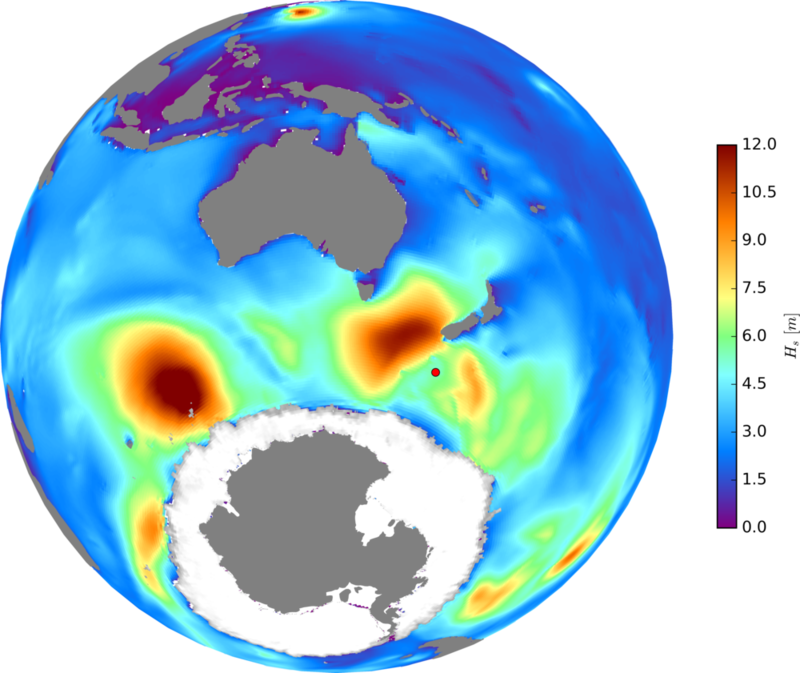 The method used to estimate extreme Hmax accounts for the long-term uncertainty of the severity of the environment and the short-term uncertainty of the severity of the maximum wave of a given sea state, complying with the International Organization for Standardization (ISO standards). Example of Storm Watch programme. T indicates present time. We use such ensemble forecasts to provide the best possible site-specific warning to clients of upcoming severe conditions, using pre-set thresholds to define the level of alert. Up to 60 wind and wave ensemble forecasts can be used to support a storm watch programme. An example of email alert is illustrated below. All components of the email can be customised upon request. Example of Storm Watch alert email. Storm watch guidance. Orange shading indicates when the alerting thresholds are exceeded. Wsp: windspeed. Hmax: maximum wave height. Hs: significant wave height. 90 PCTL: 90th percentile. Wave height warnings. Red shaded area represents the incoming wave direction for which thresholds are exceeded. MetOcean Solutions can set up a storm watch programme for any location. For more information, or to discuss your site, contact us at enquiries@metocean.co.nz. MetOcean Solutions joined the Defence Technology Agency (DTA) in a training exercise in Army Bay, Whangaparoa during May. As part of a larger trial involving the New Zealand Navy and Air Force, DTA were testing a wave buoy and integrating the data into the SurfZoneView beach landing software. The field phase of Exercise Joint Waka was held at Army Bay and the inner Hauraki Gulf from 14-19 May 2017. It involved New Zealand Army vehicles, amphibious sealift vessel HMNZS CANTERBURY, and Royal New Zealand Air Force NH90 medium utility helicopters. The exercise sought to enhance the New Zealand Defence Force’s ability to deploy offshore to deal with any contingencies including humanitarian crisis, natural disasters and instability within our region. Figure 2: Amphibious vessel used for the landing exercise. Developed in a collaboration between DTA and MetOcean Solutions, SurfZoneView allows the visualisation of beach landing conditions. Moving people and equipment from sea to land is one of the most complex tasks completed by the New Zealand Defence Force. Such operations are necessary when port facilities are not available, for example when providing natural disaster relief in New Zealand and the Pacific. The safety and success of shore landings are largely dependent on surf zone conditions, and SurfZoneView uses hydrodynamic modelling to provide a rapid and accurate assessment of the waves and currents at any location. Clear, easy-to-use maps of the nearshore conditions are displayed along with tools to assist with operational decision making. Figure 3: Dr Jamie Halla (left) and Theo Zlatanov (right) from DTA and Dr Rafael Guedes from MetOcean Solutions (centre) getting ready for the trial on the Canterbury ship. Senior Oceanographer Dr Rafael Guedes was involved with the trial. “It is very hard to assess the beach conditions when you are out at sea. Wave breaking patterns and surf zone currents can change drastically over only a few tens of metres as they are influenced by local bathymetry. By the time a vessel is close enough to the shore to allow operators to judge conditions, it is often already impacted by the waves. SurfZoneView allows operators to visualise the conditions over a stretch of coastline, to help them decide where the best landing place is that day, or sometime in the near future. Figure 4: It is very hard to assess nearshore conditions from sea. “The surf zone conditions vary from day to day depending on wind direction, swell characteristics and general circulation. To model the surf zone, the software needs input data describing offshore conditions. These data can either come from forecasts or from real-time measurements such as those from a wave buoy. Figure 5: Screenshot from MetOceanView showing the forecast site at the location where the New Zealand Defence Force wavebuoy was deployed. “In this training exercise, we used both. DTA deployed a wave buoy to provide real-time conditions, and we also set up a high resolution forecast site for the location. We can set up a forecast site within an hour, rapidly making available reliable wind, wave and current predictions. The buoy data provides an accurate description of the local conditions, and the forecast allows us to predict how these conditions will change over time. See the example maps of the maximum wave height predicted by SurfZoneView in Figure 7, during the events marked by the black vertical lines in Figure 6. Information from the model is automatically processed to define safety thresholds including whether it is safe to attempt landing on the shore. These thresholds can then form part of the information assessed by operational staff when making a go / no-go decision. Figure 6: Forecast provided by MetOcean Solutions during the period of the exercise, showing significant wave height (Hs) and peak wave period (Tp). Black vertical lines show the events along the development of the storm chosen as input conditions for SurfZoneView. Significant wave height, Hs, is the average height (in metres) of the largest one-third waves. It approximately corresponds to the height of waves as estimated by a trained observer at sea. Peak wave period (Tp) is the wave period (in seconds) of the most energetic waves in a sea state. Figure 7: As the storm progresses, landing conditions worsen. Example output for the two events highlighted in Figure 6, showing maximum wave height increasing around the landing location. Coloured line along the shoreline displays safety thresholds for the landing vessel. “Models are most accurate when we use the best possible input data," adds Rafael. "Wave buoys provide site-specific, accurate data very quickly. Using such buoys alongside SurfZoneView allows the New Zealand Defence Force to go to any location, deploy a buoy and within less than an hour access accurate data to help them land personnel and supplies safely. To aid operation planning, MetOcean Solutions can set up a site-specific forecast for anywhere in the world. This means that we can quickly generate a forecast for wherever SurfZoneView needs to be used, thereby providing the best possible support for the Defence Force and other users. Figure 8: Based on chart depth, wave height, tide level and wave setup, SurfZoneView displays safe water levels for vessels approaching the shore. Left: map displaying safety thresholds. Right transect (indicated on map) profiles for (top): maximum wave height, including cross-hatched area for breaking waves; and (bottom): water depth and corresponding safety thresholds. SurfZoneView was developed in close collaboration with DTA, and several overseas navies have indicated interest in purchasing the software.